Things we learned from yesterday's goal-less draw at the Stadium of Light. Will the away win come? You would imagine Burnley won't get a better opportunity all season to win away than at doomed, demoralised Sunderland. But, in the end, a point was gratefully received after a second half rally from the hosts. Had Burnley got their noses in front in a dominant first half display, with the crowd not needing much encouragement to turn against the Black Cats, that might have been enough. They squandered a number of opportunities to punish Sunderland, particularly down the left, where Stephen Ward was allowed to push on unchecked by a narrow home midfield. And Ashley Barnes missed probably the chance of the game when he couldn't direct an effort from Scott Arfield on target from close range. In the second half, Sunderland, with nothing to lose, had a go, and Burnley never regained their grip on the game. They were indebted to the hosts' poor finishing, and good goalkeeping from skipper Tom Heaton, though they could have won it at the death through substitute Sam Vokes, of which we'll mention again later. Burnley now have three away points, equalling the record low set by Derby County - who won only 11 all season home and away - in 2007/08, and have four games to improve on that. Their four points won in 2009/10 under Owen Coyle and Brian Laws is the second lowest, and the Clarets have still to go to Middlesbrough, Everton, Crystal Palace and Bournemouth. I mentioned the late chance for Sam Vokes, who nicked the ball from Belgian centre back Jason Denayer and forced a save from a tight angle from Jordan Pickford. But Vokes was clearly pulled back by Denayer, and the angle he ended up shooting from was of little advantage. Referee Bobby Madley, whose decisions were impossible to predict all afternoon, should have helped him out, but should Vokes have gone to ground? Sean Dyche smiled after that he didn't want to open that particular can of worms, and there is much gnashing of teeth when a player simulates contact, and rightly so, but when a player exaggerates contact, is that gamesmanship, clever play? Vokes was fouled, and got no help from the officials, and, while we don't want to see players making a meal of challenges, when you don't get what you deserve, can you blame them? Vokes was criticised for not going to ground under a challenge from Swansea left back Neil Taylor two years ago, and it's obviously not in his make up, but you wonder if Burnley need to be more streetwise at times. Sean Dyche often talks of his team's framework, of transitions, from defence to attack, and vice versa. And if you don't perform both roles, you'll not be long for the starting XI. Burnley yesterday had over £28m of talent on the bench, which cost more than the side which started. And when you are struggling to penetrate, as they were second half at Sunderland, you have to wonder how they can find a way to get the best out of Steven Defour and Robbie Brady in those situations. 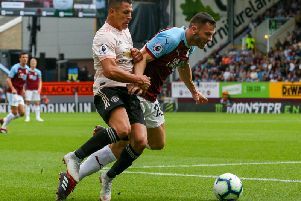 Brady has had a slow start to his Burnley career, and found himself on the bench for the last two games after three starts in which he was far from his best. Defour, meanwhile, was always going to be on the bench at best after weeks out with a hamstring injury. Brady got on, with 15 minutes remaining, but Defour stayed seated, with one substitute unused. Joey Barton and Jeff Hendrick were unlikely to be sacrificed, and Defour coming on might have led to a change in shape, and moving away from the two up front Dyche prefers. Would Defour have got more out of Andre Gray, for example, though? With so much space in behind John O'Shea and Jason Denayer, it was made for a killer pass from the Belgian. With safety in sight, you can make a case for Burnley being risk-averse, particularly away from home, but Sunderland were there for the taking.